Opening soon: Luxurious Right Lead Farm in picturesque Trout Lake, Washington, 25 minutes from Hood River. If you have a horse who has worked his or her life for you, and it’s time for some R&R, I am here to welcome your pet into my home and my heart. Beyond four meals a day and stall care, daily services include blanket changes, hoof picking, and texts, photos, or videos of your equine friend grazing on 16 acres of pristine pastures. I will do whatever I can do to make you and your horse happy. You are welcome to visit anytime. Also available for regular full-care boarding. Feel free to bring in your own trainer and ride in the brand new indoor arena or just enjoy riding our endless trails with double mountain views. 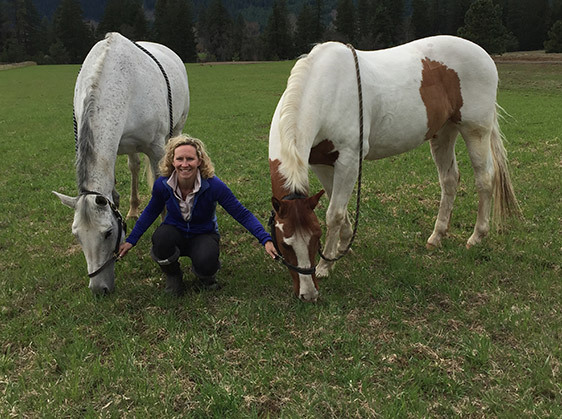 My vision was to create a horse heaven in the Columbia River Gorge. I have 5 stalls still available. Call to discuss and reserve your horse's forever home. Barn will be completed fall 2018. Owner lives on site. © 2019 Right Lead Farm / allyson@rightleadfarm.com / 503.449.3854 / Website Design and Development by Bourke Design in Portland, OR.